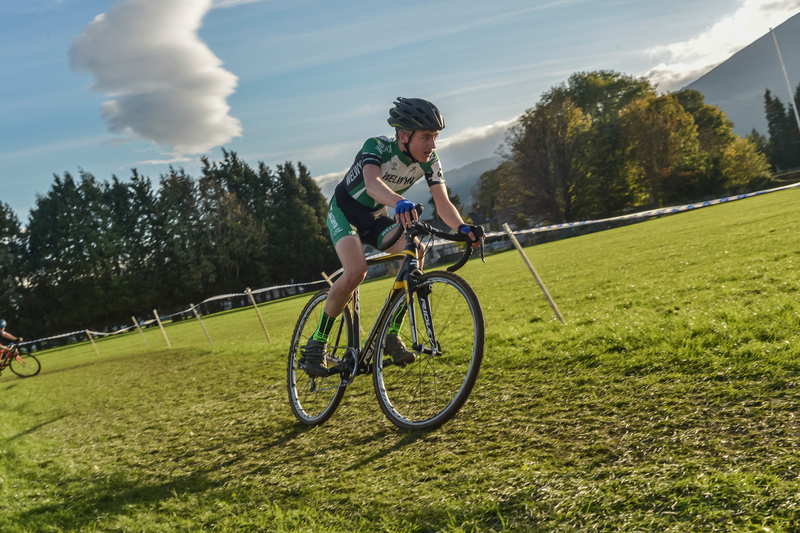 A number of the top club youth riders travelled to Bradford for Round 5 of the National Cyclo-cross series on Sunday. A tough technical course on a cold, bitter day with icy conditions which made it a hard days racing. Oli Stockwell needed to get a good result to be a contender for the series having lost the yellow jersey in the previous race due to a crash – he got into the leading group in the first lap on a course which included a hard climb on each of the 4 laps – his training and bike handling skills on the CX course at GSP enabled him to cope with the course and dominate the race on Sunday. He attacked and rode away from the field and won on his own with a fantastic ride to regain the yellow jersey with just one race remaining on January 7th at Ipswich. Archie Peet finished 13th and Joe Kiely 15th at Bradford. Euan Woodliffe, Caelan Miller and Callum Moir rode in the under 14 race with Euan, as series leader, needing to get to the front and mark his nearest challengers. He attacked and was in the leading group on lap 1 but crashed and had to run up the climb and lost contact with the leaders. He was unable to recover from the situation and eventually retired from the race. A good performance at the final race could still enable Euan to finish in the top three in the series. Caelan Miller finished in 18th place and Callum Moir 39th. A number of the club riders had planned to go to Hillingdon for the Central League race but the traffic conditions on the A1 and M25 made it difficult for them to get to the event. One rider who did make it – Charles Rollins –won the under 16 race as he lives close to the Hillingdon venue. Dylan Starkey was third and the only club rider in the Eastern League event in Ipswich.